TTD will be celebrated Annual Karthika Vanabhojanotsavam Festival on November 24, 2013 (Sunday) in Tirumala. The Karthika Vanabhojanotsavam festival was introduced by Sri Tallapaka Pedda Tirumalacharya in the 15th century. TTD has began the celebration of annual Vanabhojanotsavam in the holy month of Karthika since 2010. On this Karthika Vanabhojanam annual Festival occassion the temple priests will perform Visesha Samarpana to the processional deities of Lord Malayappa Swamy and His consorts Goddess Sridevi and Bhudevi. Samarpana will be performed again in Vahana Mandapam, which is located opposite to the Main Temple. 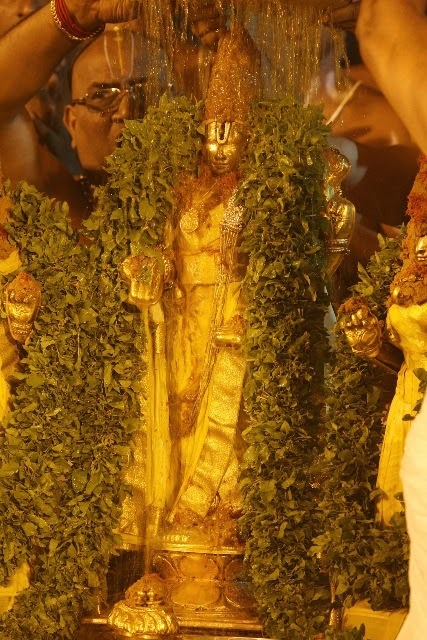 Later the processional deity of Lord Malayappa Swamy mounted atop small Gaja Vahanam will be carried in a grand procession to Paruveta Mandapam (2KM from main temple, located in Papavinasanam Road, Tirumala). Idols of his two consorts Goddess Sridevi and Bhudevi also will be taken out to Paruveta Mandapam in a colourful procession on separate Ivory palanquin. The deities are seated on a huge golden platform and Snapana Tirumanajanam will be performed at Paruveta Mandapam between 10.30am to 12.30pm, first with spices water followed by milk, curd, honey, coconut water, turmeric paste and finally sandal paste is applied to the deities. The deities who are draped in white silk clothes are adorned with Tulasi garlands and the priests will offer Nakshatra Arti and special arti to the deities marking the completion of the Tirumanjanam ceremony. Later the deities will be decorated in colourful silk vastrams and dazzling diamonds studded gold jewels and they are seated on a special mandapam inside the Paruveta Mandapam. At the end, Annamayya kirtans sing by Annamacharya project artistes and Harikatha Parayanam, Bhajana Troupes stand as special attraction to the pilgrims on this auspicious day. During the holy month of karthika it is a tradition in our country to dine in community called “Sahapankthi Bhojanam” leaving aside all the differences.